Novi Sad dramatically welcomes visitors with its formidable fortress and clock tower boasting reversed hour and minute hands. Like so many strategic spots in the region, Novi Sad also has a complicated history. It’s been conquered by the Celts and Romans, Byzantines, Hungarians, Ottomans and Habsburgs. The city’s complex past is reflected in Novi Sad’s eclectic architecture, and well-illustrated by the whimsical windows featured here. From strolling the grounds of the Petrovaradin Fortress just before sunset, to taking in the city center’s splendid architecture, we spent many pleasant days in Novi Sad, Serbia’s second-largest city. Other notable memories were created thanks to the special people with whom we crossed paths. At the fresh fruit & vegetable market (Futoška Pijaca), we had fun interacting with vendors selling juicy cherries, strawberries, and veggies. When we mentioned our love of the region’s ajvar condiment to one merchant, she insisted that we return the next day so that she could retrieve a jar of her homemade ajvar from home and then share it with us. We eagerly accepted her offer and found the ajvar, with its blended peppers smoked to perfection, to be some of the best we have had in the Balkans. We were touched by this Novi Sad resident’s gesture as we so often are when meeting locals during our travels. Need more inspiration as you plan your travels through Serbia? From Belgrade to Subotica, my Serbia guide shares my highlights from the country. Do you fancy collages? From more windows of the world, to coiffed horse tails and delectable Spanish appetizers, take a peek at my collage series. 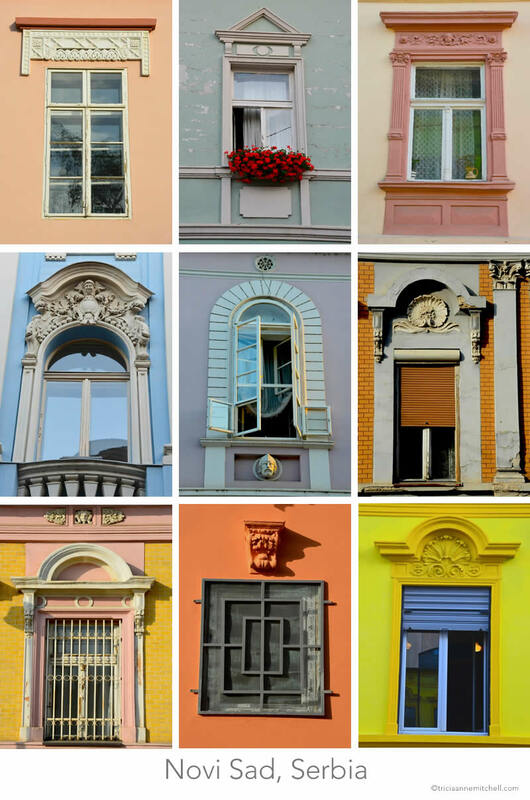 Great collection of window pics; I also like the pretty wall colours. Roamingpursuits, glad you enjoyed the glimpse into Novi Sad. I also liked the blend of traditional, and not-so-traditional hues. The fluorescent lemon and sun-drenched pumpkin really are eye-popping. I’m ever on the hunt for fun architecture – can you recommend any places to photograph? And finally, thank you for dropping by! If you like Victorian architecture and funky modern buildings, Melbourne has an interesting mix of both. That sounds like a kind of blend that we’d definitely appreciate. We haven’t yet had the chance to visit Australia – perhaps in 2015? :) Thanks for sharing the Melbourne recommendation. Hope the first weeks of 2015 have been treating you well – it’s fun to be back in the blogosphere again after a brief hiatus. How have you been? Doing well, thanks! The window flourishes do indeed look like frosting, and the pastel colors add to that feel. Beautiful as always, Tricia. Are you still in Oberammergau, or are you already on a new adventure by now? Cornelia, Vielen Dank for your thoughtful feedback. We’ve actually just left snowy Oberammergau, and are now visiting family in the United States. It’s our first time back in 2 years, and we’re enjoying catching up with family and friends, and American culture. We are California-bound in a few weeks, and it would be lovely to meet up, but I think we’ll be a bit too far from your neck of the woods. Are you contemplating a return to Germany in 2015? Hi Tricia, how wonderful that you be visiting friends and family on this side of the ocean. Where are you going to be in California? Maybe we could meet up? I might be going to Germany for a quick visit in September for the wedding of one of my nieces. Cornelia, we’ll definitely be in Napa Valley in the short-term, and perhaps San Francisco and Southern California farther out into the future. I’ll keep you posted as it certainly would be fun to meet up. How wonderful for you Tricia, those areas are on my wish list to go to revisit. Have a blast of Joy there and keep me posted. Thanks for your travel wishes, Cornelia. We’re now soaking up the sunshine and the views in Bodega Bay. What a “winter” this is. :) Hope you’re enjoying the weekend! That’s what I miss in modern architecture – the wonderful idiosyncrasies to be found in old buildings in windows and doorways. I adds so much local character and provides an opportunity for the use of vibrant colours. Greetings Dorothy, I share your preference for quirky buildings and designs too. Perhaps that’s because I grew up in what can be considered an old home by American standards (circa 1872). Are there any particular cities that you’d recommend to soak up such architectural diversity? You have a beautiful blog. It’s absolutely gorgeous and inspiring! Your pictures make me want to venture to Nova Scotia! I love this! I got caught in my thoughts and meant Nova Sad! My apologies! No worries. :) My mother-in-law is originally from Novi Scotia, and I hear it’s quite scenic as well. There’s so much to see in the world! Hi Andrea, thanks for stopping by, and for your complimentary words. As you can relate from your experiences tiptoeing around the globe, travel is indeed revitalizing. I’m glad to hear that you left my site feeling inspired. Where are you hoping to go next? My sister and I are hoping to go to Barbados next month (my favorite island!) and then I have booked a trip to Iceland with my boyfriend in April. I’m so excited! Any travel plans for yourself? Sounds like you have some fun adventures in the works, with special people. I’ve always been curious about Iceland, and have only stopped there on layovers. I do remember how rugged and interesting the landscape looked, what little I saw of it. For the moment, we’re getting reacquainted with the USA. It’s our first time ‘home’ in 2 years, so we’re enjoying time with friends and family, and a few weekend jaunts to sunny California. We’ll eventually head back to Europe. :) Wish you safe travels! The fine details in these windows are gorgeous. My favourite is the first one. It’s just a little different. Carol, window #1 does have a refined look about it that makes it really pretty. Wouldn’t it be fun to be the architect that dreamt up all these designs? :) Lovely to hear from you – how has summer been treating you? We’ve had a great summer. It’s been very hot and we have had some lovely rain. We did a short caravan trip for a week to two lovely places less than 2 hours’ drive from home. It was lovely to explore nearby. How is your winter going? So often, spots near home can be overlooked, so it’s nice to hear that you’re taking full advantage of your surroundings, Carol. We’ve had two different strains of winter so far. :) We had a traditional German Christmas and rang in 2015 in snowy Germany with my family (and 1 meter of snow! ), then hopped over to North America to visit family and friends. Sunshine and warmer temps are plentiful now. We’re mostly spending time with loved ones, but did take a weekend trip to California. I don’t think I could ever take the seaside views and sunshine for granted, particularly after having grown up in a snowy, wintery place. It sounds like you’re enjoying the best of both worlds. Happy New Year to you all! Love that second shot with the roses…contrast and also just a perfect glimpse into a different world/architecture, with the framing and paint peeling off the building. :-) Safe travels! :-) Nothing quite like seeing both sides of the spectrum. Cheers to a happy Year of the Goat!